I'm a needlework lover. I want the pattern for the ribbon bolero! Thanks Bunrab! I got this today! I have a couple of rings in front of it. Sounds interesting! This was a really fun read. At first, I thought that it was going to be boring, but it quickly got interesting. There was something about Betsys thinking that didnt seem right, but overall it was an enjoyable read. The story didnt seem quite as smooth as it could have been. I liked most of the characters. Okay, I am such a slacker when it came to this book. I passed it on to my momma and she read it first while I caught up on some other bookrings. She kinda liked it. She liked it so well, she said she would like to read the next books in the series. Then she gave the book back to me. I started to read it and dag-gone-it, i really really tried to get into it. I don't know whether I just didn't like the sisters, or the town, or the concept or what - but this is one of the few (like under 5) books I have ever stopped reading halfway through. I did it though. I laid the book down and asked my mom "whodunit" and never looked back. Thanks for this opportunity, BunRab, to read this novel - even though I didn't care for it, I still loved being a part of this ring! Didn't journal when I received it as didn't have the chance for a few days. I think I'm with summermarie, although I did read right through. I guess I found the style a little jarring and the storyline not so smooth, the characters not-quite-believable perhaps? But it's something I probably wouldn't have read otherwise - and I also like needlework - so worth it anyway! Arrived safely in Melbourne through the week, sorry I didn't have a chance to get online until now! I should have it read shortly, although there is one other in front of it. This was an OK read, but I found a lot to pick on. I found it fairly choppy, with individual scenes being good but not tying together, and the characters were a bit caricaturish - I didn't get to like Betsy at all, and the other characters didn't flesh out very well. 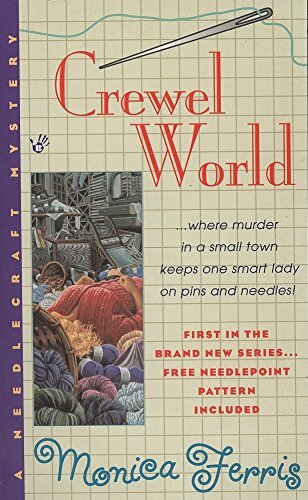 I thought she did an excellent job of the shop settings and needlework characteristics, and in a way I wish she'd decided to do a different type of book - this is possibly the first book ever where I've worked out who the murderer was early in the book, and while the idea was good the way it was executed was average. I'm glad I had a chance to read it, and I did quite enjoy reading it, but I was a little frustrated because it could have been so much better. I already have an address, so will be passing it on soon. edited to say - posted on the 15th December. I am so sorry, I should have registered this one ages ago... It has arrived and I did really like it, the only drawback is I guessed the murderer far to early... but it is a really cosy book.